Sometime last year, I discovered Martyn Lloyd-Jones (MLJ). MLJ was a preacher at Westminster Chapel in London from 1939 to 1968. During this time, he established himself as one of the greatest preachers in the Christian world. The theologian Emil Brunner regarded MLJ as the “greatest preacher in Christendom”. A couple of years ago, the minister at the church I was attending began to transition to retirement. He purged his library, and I wound up with many of his old books. One of the books of MLJ’s Spiritual Depression. I don’t even know if I flipped through it. I didn’t think anything about it. Months later, I was listening to some talks by John Piper. Piper has a conference message he gave on MLJ, and it was through that message that I realized the influence and fame of MLJ. I decided to begin reading some of his works. Here are quotations from well-known ministers about the influence MLJ had upon their lives. One of the greatest preachers of the 20th century was Martyn Lloyd-Jones, pastor of Westminster Chapel, London for 29 years until his retirement in 1968. He died March 1, 1981. But his writing and preaching continue … I think preachers need to hear this kind of preaching as a partial antidote to the relentless trivializing of preaching in our day. 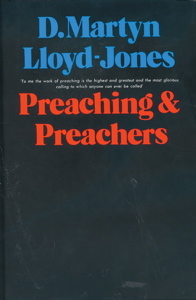 In 2011, Tim Keller is blogged his thoughts on MLJ’s Preaching and Preachers. He too was influenced by the writings of MLJ. I know that many of my readers aren’t ministers. Still, I think that you’ll enjoy the series on this book. Many topics are covered in the book. And, if you are a member of a church, you are affected by many of the topics that he addresses. Even if you end up disagreeing with him on many issues (and I disagree with him on many issues), his thoughts are worth engaging and thinking through.